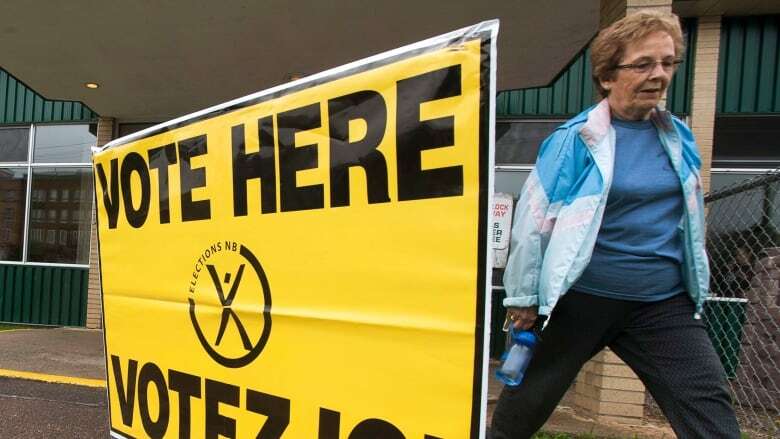 The post-election turmoil unfolding in New Brunswick has thrust the debate around electoral reform front and centre in the Quebec election campaign. All the main parties except the Liberals want to replace the first-past-the-post system. The post-election turmoil unfolding in New Brunswick put the question of electoral reform front and centre on the Quebec campaign trail Tuesday. The Progressive Conservatives eked out a victory in Monday's election, winning 22 seats to the Liberals' 21, in a legislature where 25 is required for a majority. That's despite the Liberals getting 37.8 per cent of the votes, compared with the PC share of 31.9 per cent. Premier Brian Gallant said he would try to win the confidence of the legislature. Liberals and PCs continue battle over who will govern N.B. Parti Québécois Leader Jean-François Lisée​ said the outcome is further evidence of the need for change in Quebec. "What happened yesterday in New Brunswick is an advertisement for our proposal for proportional representation," Lisée said Tuesday. The PQ, Québec Solidaire and Coalition Avenir Québec all want to replace the first-past-the-post electoral system with a version of a mixed-member proportional system. The change would mean that, while voters would still elect a local MNA, a share of seats in the National Assembly would also be reserved for the popular vote. But the Couillard Liberals don't want anything to change. They argue Quebec's less-populated regions would lose their voice in at the legislature in a proportional system, and that any bill to change the system would need unanimous support in the National Assembly. "This is not on my list of proposals for Quebec," Couillard said Tuesday, arguing that electoral reform is "not a priority for Quebecers." For his part, CAQ Leader François Legault said the New Brunswick result isn't top of mind, saying he's "confident" his party will win a majority. Polls in Quebec, however, suggest a minority government is most likely, with the PQ or Québec Solidaire potentially holding the balance of power, much like either the Greens or People's Alliance in New Brunswick. Lisée​ predicted that such results, where smaller parties play a more important role, are likely to become more common as electoral politics grows increasingly fragmented. "We are no longer living in a bipartisan universe," he said. "Minority governments will be more frequent than in the past." Get everything you need to know about the Quebec election, directly to your inbox. Sign up for our newsletter Ballot Brief here.